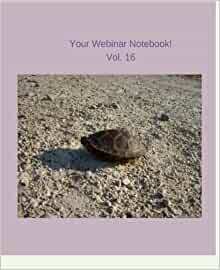 You'll find plenty of inspiration by the turtle on the cover of this webinar journal. Take your time (like she would) and learn, explore, brainstorm, plan, the next steps on your journey. 7.5 x 9" with take action prompts to keep you going until you reach a wonderful pond with new friends, or where ever your journey takes you next!